Getting there: Reached by car, bus or ferry in summer. Ferries depart regularly from San Antonio harbour and various hotels along San Antonio Bay. The bus can be caught at the bus station in San Antonio or along the bay road. Parking is not possible anymore directly at the beach, the access is shut with a barrier. There is a large space designated for parking, left before the barrier. Don't park along the road even if many other cars do so - it is prohibited, the police controls and gives out fines regularly. For many, Cala Conta needs no introduction. For those who've not yet experienced her crystal shores, you're in for a very special treat. Cala Conta has fabulous views of the little islands dotted near Ibiza's coastline, beautiful turquoise waters and several different areas to explore, making it one of the best beaches on the island. There are two stretches of sand, one backed by a rocky coastline, the other by sand dunes. The shallow water is safe for children and as clear as a swimming pool. Be careful when swimming into the open sea; there are very strong currents here - so even more experienced swimmers should avoid aiming for the island offshore. In the high season the beach is very popular, so come either in the early morning or later in the afternoon. The area of sand is only small, but the waters so inviting you'll spend most of your time there anyway. The many rocky outcrops also make Cala Conta an interesting place for snorkelling. 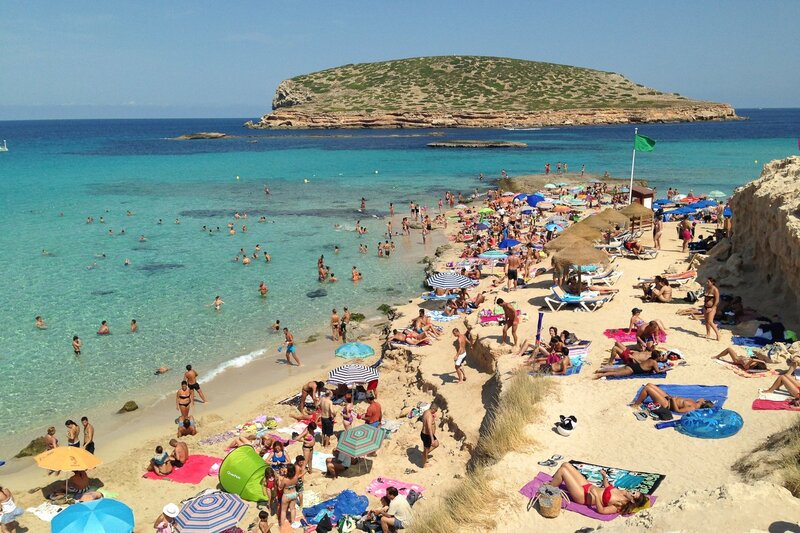 Cala Conta is also one of the best beaches to catch the sunset from, with crowds gathering on land and boats dropping anchor further out to see the soothing spectacle. The two main beaches are separated by the most Bohemian of Ibiza sunset cathedrals, beach restaurant Sunset Ashram, which has fabulous panoramic views from its exposed position, and a creatively designed framework which mimics the rocks on which it sits. In the evenings, Sunset Ashram hosts various DJs to play during the spectacular sunsets, but first and foremost it's a place to relax. Further round on the right-hand side are 2 restaurants which are easily reached by foot, both of them are a great spot for fresh seafood. Spotlight tip: A third and smaller cove, called Cala Escondida by the locals, is at the far west end and reached from the top of the cliffs by steps hewn into the rock. It is popular with nudists and has a small chiringuito, one of the original beach bars of the island serving healthy food and there's also an eco-toilet there. The resorts San Antonio bay and San Antonio or only a short drive away, at these locations there is a wide range of hotels and apartments. Only a 30-minute stroll from Cala Conta, the 7 Pines Resort Ibiza offers ultimate luxury with spectacular sea views from a clifftop position. The spa, restaurants and bars also welcome non-hotel clients. Or book a local holiday villa, which is an interesting option for larger families and groups.